This traditional home makes the most of a smaller square footage with its smart layout and open living spaces. The great room is at the heart of the home, with French doors opening out to the screen porch with sun lights in its cathedral ceiling. The spacious kitchen is tucked away in the corner looking out to the common area over a curved bar, which mirrors the columned entrance to the dining room. Located off to the side for privacy, the master suite includes a well-appointed master bath and a large walk-in closet. 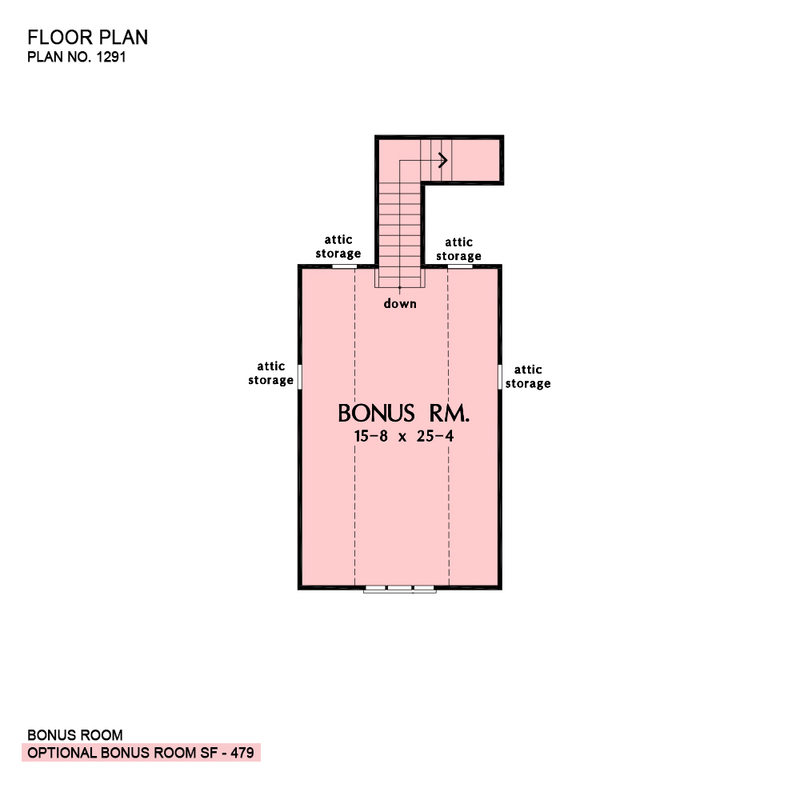 Bonus Room: 479 Sq. Ft.
House Dimensions: 63' 0" x 58' 4"
Great Room: 15' 0" x 16' 10"
Bedroom / Study (Cathedral): 12' 0" x 12' 0" x 13' 1"
Bonus Room (Flat): 15' 4" x 25' 4" x 8' 11"
Dining Room (Flat): 10' 4" x 13' 0" x 9' 0"
Foyer (Flat): 7' 8" x 6' 0" x 9' 0"
Garage Storage (Flat): 10' 0" x 6' 0" x 0' 0"
Great Room (Cathedral): 15' 0" x 16' 10" x 16' 7"
Kitchen (Flat): 10' 4" x 12' 4" x 9' 0"
Master Bedroom (Cathedral): 13' 8" x 16' 0" x 14' 1"
Porch - Front (Coffered): 25' 8" x 5' 8" x 10' 0"
Porch - Screen (Cathedral): 15' 0" x 12' 0" x 18' 3"
Utility Room (Flat): 6' 0" x 9' 4" x 9' 0"